Instead of investing in costly metal bracelets, many fashionistas worldwide are choosing colorful customized wristbands to complete their look. These are rubber bracelets that you can personalize at a cost-effective price to show your unique fashion style. Inexpensive Colorful Accessories: Even if you have a low budget, you can customize many wristbands in different colors and match them with your dresses. You can also wear many of them at one time to have a unique look. Easy Customization: It is very easy to make your own wristband. You just need an idea and Internet connection. You can customize it in a way that it reflects your personality and gain the attention of people at an event. Lots Of Options: There are many kinds of wristband types, ranging from debossed, laser made, and dual layer to ink-filled. Apart from that, these silicone bracelets come in different sizes- 1-inch, ½-inch, ¼-inch, and ¾-inch. Cost-effective: Rubber wristbands are an affordable accessory for your wrist. You can get many of them at a cost-effective price and enhance your fashion game. Accessory To Wear Anytime: You can wear many wristbands at one time. In addition, they can be worn anytime with any kind of clothing. They are easy to wear and do not require a special maintenance. Multiple Purpose Wristbands: Apart from fashion, rubber wristbands can be used for various other purposes. Today, they are being customized by non-profit organizations, businesses, and many other sectors to promote their purposes. 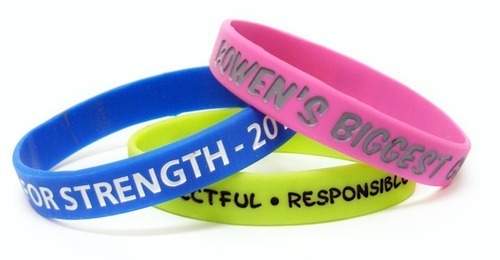 If you also want to get some customized wristbands, then design them at Make Your Wristbands. We have all kinds of wristbands at affordable prices. You can design them as per your need. You can also engrave a personal message on these wristbands in your favorite font.